Artesia Little League’s Minor Division All-Star Team brought home the District 2 championship June 29. 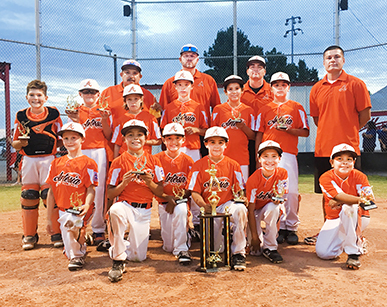 The Artesia Little Leaguers went undefeated on the tournament, scoring a whopping 98 runs to their opponents’ 28. The team is scheduled to open their State All-Star Tournament run at 5:30 p.m. July 13 in Los Lunas. The Artesia Little League 9-11-year-old All-Stars, who also won district, will also open their state tourney at 5:30 p.m. July 13 in Albuquerque.